After seeing her chiropractor, something clicked for Dr. Heather. She knew that becoming a chiropractor was what she was supposed to do in life. After earning her undergraduate degree from Urbana University, she went on to obtain her Doctor of Chiropractic from Palmer College of Chiropractic in Port Orange, Florida. She chose the school due to its outstanding reputation. When she’s not at the practice, Dr. Heather enjoys spending time with her husband Drew and their two fur babies Titus and Ace. She loves being outside with their dogs and playing volleyball. Dr. Heather lives for the summer months and enjoys spending time on the lake. 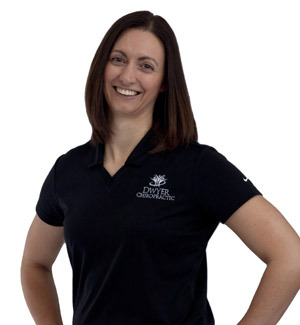 She is a member of the local chamber of commerce and the Ohio State Chiropractic Association. Dr. Heather and other members of the Dwyer Chiropractic team also like to give back to the community by holding food drives a few times a year to benefit Help House, which serves families in need. The team also helps a local elementary school by holding a school supply drive. Find out for yourself how great you can feel with safe and natural chiropractic care. Contact us to book an appointment with Dr. Heather!